A graphics tablet can a make a big difference when you’re using programs such as Photoshop and Illustrator. Used by designers and artists, graphics tablets allow you to write or draw using your PC as easily as if you were using a pen and paper. When you use a graphics tablet, you can digitally recreate designs you’ve sketched out on paper so they look professional. If you have illustrations you want to give to friends or clients you can print them out or send them via email without any fuss. Our graphics tablets are compatible with Macs and PC’s and are incredibly easy to set up, so you’ll be up and running in no time. using a graphics tablet feels natural no matter what you use it for. There are a range of options available here, from cheap graphics tablets to tablets that cater to a higher budget. 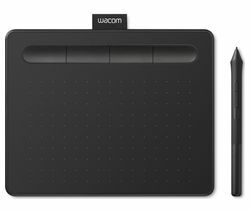 If you're looking for something that isn't too pricey, our Wacom graphics tablets are both versatile and affordable. For a quick and easy solution to computing on the go, even when you want to travel light, check out our entire range of tablets. 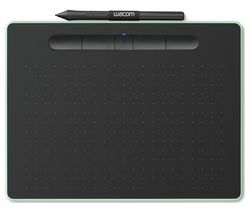 Whether you’re a designer who wants to create professional looking designs or you simply want an easy way to produce your work on a computer, a graphics tablet is ideal.